It’s easy to own a big collection of videogames. Just buy as many as you can for as cheap as you can afford. This mentality resulted in an unwieldy NES collection. Games were so cheap when I started collecting in 2009! Now that some have skyrocketed in price, I wondered, as I cataloged my collection: is it more valuable to own as many objects as the collection contains? Or just my favorites? Or none at all? If you want to complete everything, then build up a nice area to display your collection and have at it! Conversely, if you want to just have everything all in one folder to either play on a console/computer or using an arcade option, that also cuts through the need for archaic physical objects. After all, shouldn’t it be about the game itself? The packaging is just fluff, right? That’s where collecting can go too far. Especially back when you could buy cheap games everywhere, why not just buy another copy of the game you might already have? Then your collection skyrockets as you collect all duplicates of games you don’t need, but maybe someone else does… so then you might trade one or two games, then, gradually, lose interest in the whole bunch, so they sit in storage for years. For everything, but more specifically the NES, I’d like to have a carefully curated collection of every game I care about and some that are just trivial fun. Nothing I can’t stand. Nothing I’m disinterested in. Nothing that lacks entertainment value for me. I could always buy them later, so why keep them now? No excess or lingering products of cheaply-purchased overabundance. All the games I remember enjoying as a kid. The ones I wanted to play, but couldn’t. The ones I saw in stores, Nintendo Power, magazine reviews/screenshots, or heard about from others. The mysterious titles with incredible screenshots. The alluring games played once at some kid’s house only to never find again (Dragon Warrior 4). In other words, the “trophy piece” titles that really make the console shine for me. Now, everyone wants certain rare titles and trophy pieces. In some regards, I own titles that are expensive or valuable to others, but mainly because they’re valuable to me in the first place. Without that, what value would they hold? Are they trophies because we’ve earned them or because others covet them? 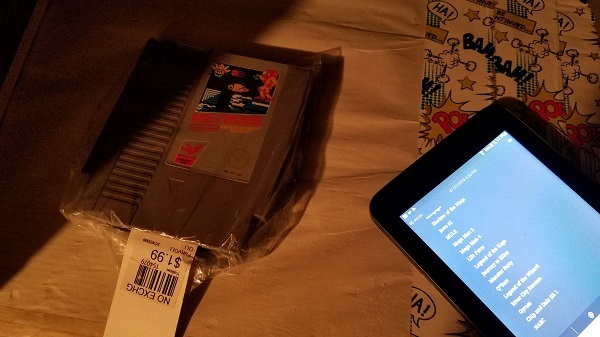 In the situation of my NES collection, I may have stories associated with acquiring some of them, but those are mainly trivial. Any collection – videogames, records, memorabilia – represents this idea. My trick is figuring out what you want out of the collection. Is it everything, the best, your favorites, or none? For this collection, the first step was identifying what I had, then through the cataloging process, determining what was worth curating [keep] or worthless clutter [sell]. Photo: Preliminary sorting with my tablet with Writer Plus. Not pictured: the tablet’s overall inadequacy. [Sober Living] Escape from Videogameland?